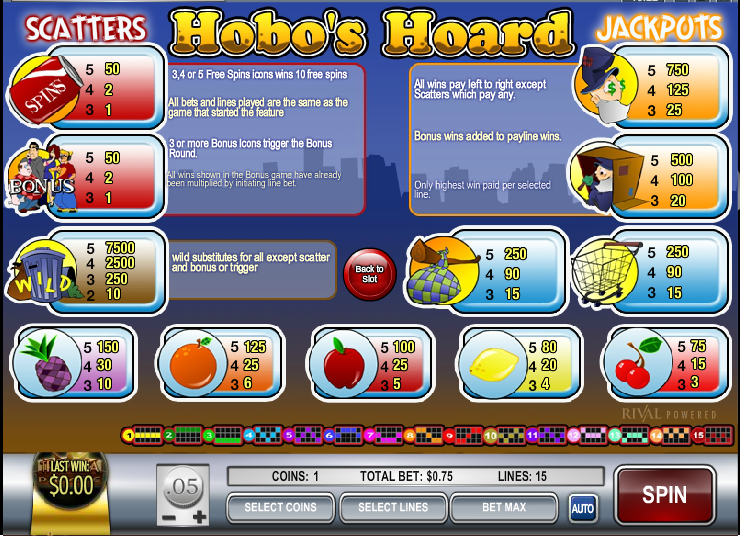 Hobo’s Hoard is a 5-reel slot with 15 pay-lines and 39 winning combinations. 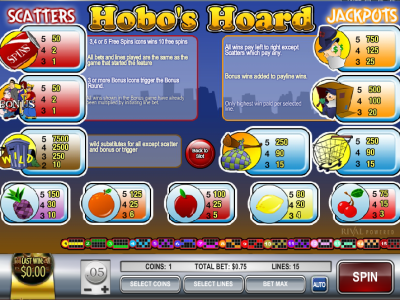 This game has a unique “hobo” theme with great multimedia effects. It depicts a colorful and vibrant display of the life that most us would not want. The rules are simple to understand and it is a fun game that is sure to have you smiling and will definitely leave you far more appreciative of your lifestyle. It has a pay out percentage of 95.65% and the jackpot winner leaves with 7,500 coins, worth $37,500. Besides a good jackpot amount this slot has wild symbols, scatter symbols, free spins and a bonus round. The coin selection is from $0.01 to $1 offering a betting range from $0.01 to $75, the maximum coins per line being five. The wild symbol is a trash can that can be substituted for all other icons, except for the scatter or bonus ones. A winning combination will have multiple wild symbols displayed, but it is important to note that only one winning combination will get paid out per pay-line, the highest paying combination will take precedence. The Spins Can and the people bonus symbols are the scatter symbols with the free spins being displayed in the reels. During free spins all wins get tripled. The bonus round is triggered when three or more bonus symbols appear randomly on the five reels. The bonus feature is played in the second screen. Named ‘Pick your Person bonus round’ it is very similar to a ‘Pick your box’ kind of a bonus game. The player has to select the person who they believe has the maximum reward.